The first full day of our vacation involved waking up in El Segundo, having another trip down into Manhattan beach for a breakfast at Uncle Bill’s (you can read a previous review here), and then driving East to Phoenix. That’s not a short drive (it’s around 7 hours counting basic stops and the like), and that usually leaves one looking for lunch around Blythe, which is pretty much the only real “civilization” for about an hour in each direction. And I’ll be honest, most of the options in Blythe aren’t that great, mostly chains (Denny’s and Pizza Hut, for example), and a few local places (La Casita Dos is pretty good Mexican, and probably should get a review visit from me sometime). 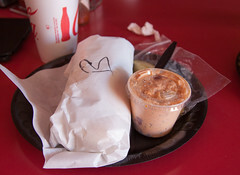 But there’s one place in town that does indeed serve up an excellent lunch, and that’s Rebel BBQ. I always have a bit of a hard time writing two types of reviews: Pizza places and BBQ places. The reason is that both of these types of food have both a substantial number of regional varieties, and both of these also have, in my opinion, a much wider spread of quality. There are a lot of mediocre pizza places, but there are a few places that are truly head and shoulders above the rest (like, say, Pepe’s Pizza in CT, or Pizzeria Bianco in AZ). The same goes for BBQ: there are a huge number of BBQ places out there, but the very best (like, say, Franklin) that are in a very different league than most, quality-wise, leading to a surprisingly large gap between “best” and “really good”. So, with that in mind, let’s talk about Rebel BBQ. 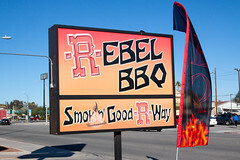 Rebel BBQ is an inconspicuous place nestled in between McDonalds and Pizza Hut in Blythe, just north of the main Blythe exit from I-10. 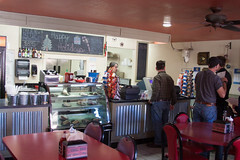 It’s a small place, with approximately 4-5 tables inside, and a few outside, and often a line of people waiting to order. 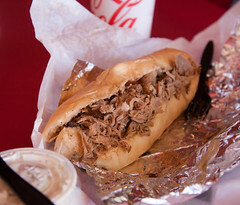 Menu-wise, most everything at Rebel BBQ is sandwiches, mostly of various smoked meats served up on a bun. I’ll be honest, I usually prefer my pork pulled, but my brisket sliced, but that’s not an option here. But no matter, I ordered up a brisket sandwich and an order of jalapeno potato salad. Let’s talk about the main act first. Despite being chopped, everything else here was a solid performance. They serve the mean unsauced, so you can taste just the meat and the sauce. A good start. Looking at the smoking itself, it was actually rather good brisket: a nice texture, a good smoke ring and bark, and a very good level of smokiness. 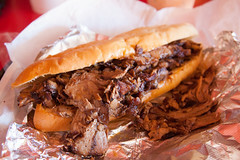 I enjoyed it, even if I do prefer my brisket sliced instead of chopped, and it made for a surprisingly good sandwich even without adding the sauce. I’ll chalk this one up as a solid performer, both in the broad world of BBQ, and that it’s also probably the best BBQ for 150 miles in any direction. I know that sides don’t make the BBQ, but Rebel also gets some bonus points for the outstanding jalapeno potato salad: it was a rich salad that focused on the potatoes with a very light sauce, but also had a very bold jalapeno note and little bits of pepper. A solid side dish to a solid sandwich. About the only weak point was the pulled pork my sister-in-law got. It was decent pulled pork, but it was a bit lacking on the smoke, and quite frankly needed some sauce to spruce it up a bit. While I loved the brisket sandwich, I’d give the pulled pork a pass. Overall, I loved Rebel. Would Rebel BBQ warrant such a high rating if it was in Texas? Well, it was no Franklin, or even a Stiles Switch, but it could definitely hold its own against your average Texas BBQ joint. The brisket I had at Rebel was better than some I’ve had from Rudy’s, for example. The brisket was very nicely smoked and tasty, and made up a sandwich that was hefty and delicious, yet affordable. Pair that with some great potato salad, and the pleasant staff, and I’ll say, if you find yourself in the greater Blythe area looking for lunch? Rebel BBQ should be your destination.